Oh it may be small, but it sure does the job! Words that any man would never want to hear by the way. But let’s get back to this fantastic promotional pin. 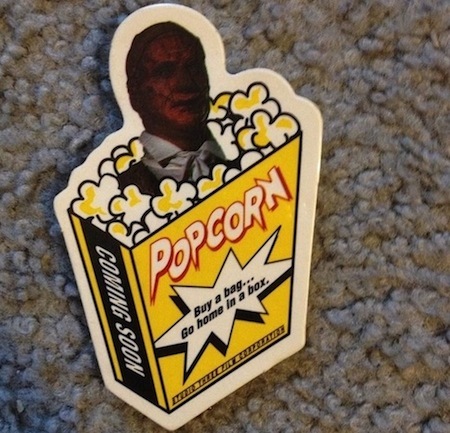 For those who don’t know, Popcorn is a great old school horror movie that came out in 1991, was set in a movie theater and has one of the best taglines ever (Buy a bag….go home in a box.) Long overdue to have a proper DVD/Blu-ray release, Popcorn is a definite guilty pleasure and at the time was a breath of fresh air in the horror movie world. If you’re interested in snatching up this pin, head over to the Ebay listing HERE. It’s cheap, so I suspect it won’t be there for long, especially since I might go buy it right now. Now let’s start the petition to get Popcorn on Blu-ray already. This entry was posted in Feature and tagged best 90's horror movies, best ebay horror items, best ebay horror promotional, best horror items on ebay, dirty horror, ebay find of the week, feature, horror movies that deserve blu-ray release, popcorn 1991, popcorn dvd, popcorn horror movie, popcorn underrated horror movie, promotional popcorn 1991 movie, underappreciated horror movies, underrated horror movies by Dirty Horror. Bookmark the permalink.